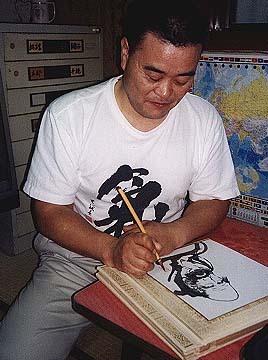 Sensei Uematsu Yoshiyuki finishes a drawing of Bodhidharma for Christopher Caile during Caile's visit to Kanazawa in May, 1999. In May of 1999 I visited Japan and stopped off in Kanazawa to see Joe Swift (see his article on "Throws in Karate"). I was introduced to Joe's Sensei, Uematsu Yoshiyuki, 8th dan and Chief Instructor of the Mushinkan Goju ryu Honbu dojo. He was a delightful, courteous, most open and humble man who was quiet interesting too. He not only was well versed in Goju Karate, but in iaido and the art of polishing and refurbishing classical Japanese swords. We sat and talked and had tea in the business office of his dojo attached to his house. We were surrounded by his collection of classical Japanese samurai swords, helmets and other paraphernalia. Topics of conversation ranged far and wide, and the hours passed among smiles and Joe's translations back and forth between Japanese and English. Yoshiyuki had also been a student of Zen for many years and was an excellent artist. He generously presented me with the drawing of Bodhidharma seen in this article, something I prize. It hangs on the wall of my office. Joe is fortunate to have Yoshiyuki as a teacher. Yoshiyuki was born on January 1, 1948 in Nagasaki, Japan. At age 9, he began Zen training at Shofukuji Temple in Saga Prefecture, where his uncle Mori Goho was the head priest. His Budo training began the next year, also under Mori, who taught Shoreiryu Karate Kobudo as well as classical Japanese martial arts. He entered the Sojiji Temple in Monzen, Ishikawa Prefecture, in 1971, and at age 24 opened the Mushinkan Dojo. He has worked to promote Budo in Ishikawa Prefecture ever since. Return to Bodhidharma: Myth or Reality?